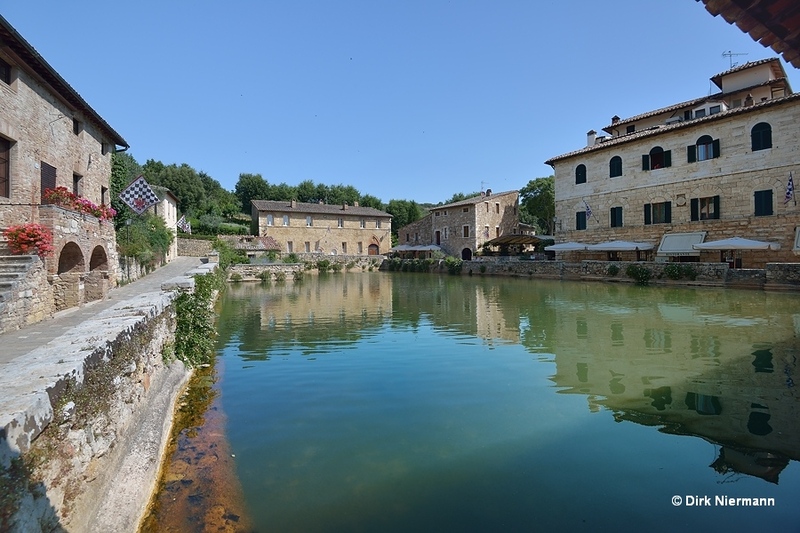 A large hot spring as town center - that makes Bagno Vignoni unique among all villages in Tuscany. 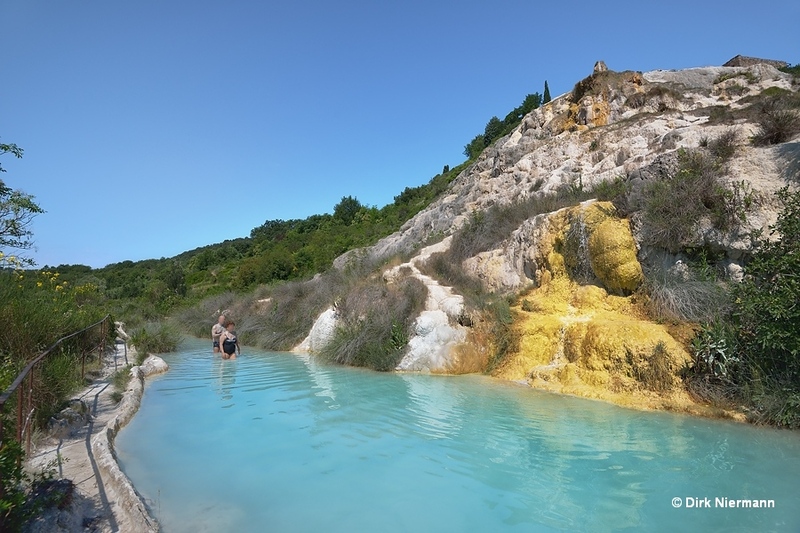 Indeed, it has been built on top of a huge travertine mound of more than 40 m (130 feet) in height, which is the result of a hot spring driven precipitation process for thousands of years. From its elevated position the village overlooks the magnificent landscape carved by the Orcia river with a view towards the fortress Rocca di Tentennano in Castiglione d'Orcia. 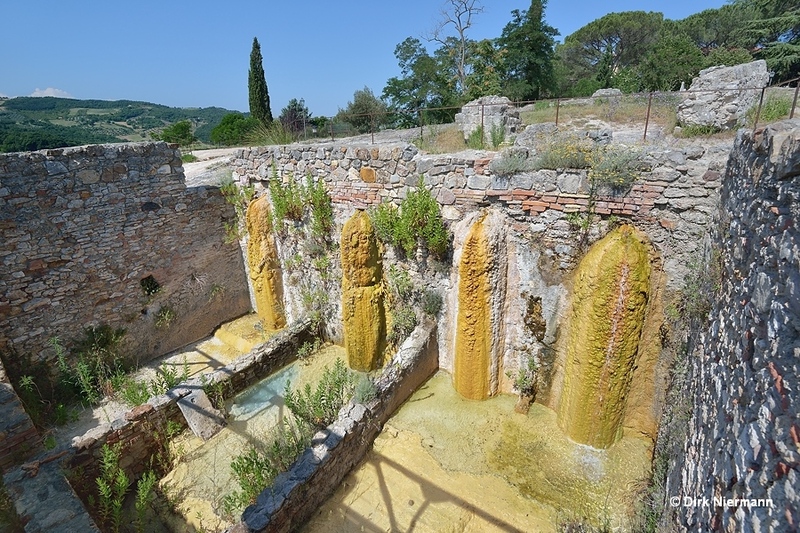 As with all major thermal springs in Tuscany, historical sources for the utilization date back to the time of the Etruscans and Romans. Later, the most famous visitors were St. Catherine of Siena, Lorenzo de' Medici (also known as Lorenzo the Magnificent), and Pope Pius II. In spite of all the conflicts the region suffered from during the Middle Ages, the historic townscape with its central basin has remained nearly unchanged. 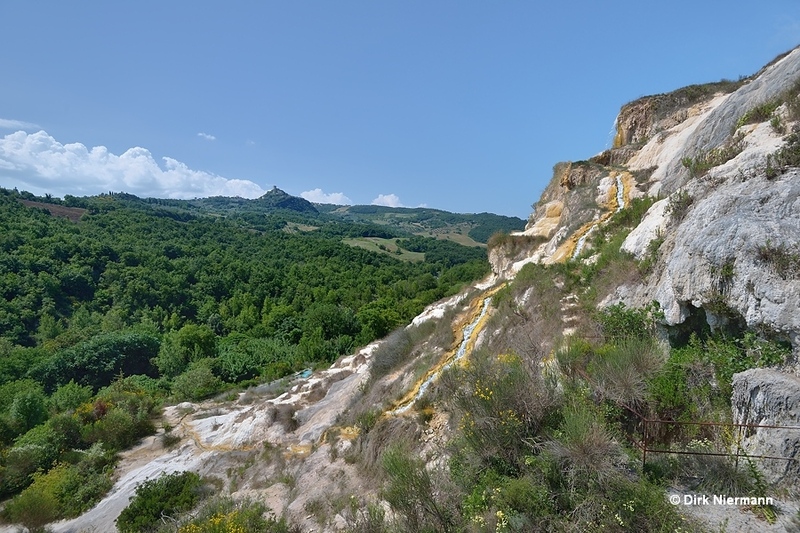 The thermal basin is called Bagno Grande (large bath) and emits CO2 rich water from the Monte Amiata geothermal aquifers deep underground at a temperature around 52 °C (125 °F). 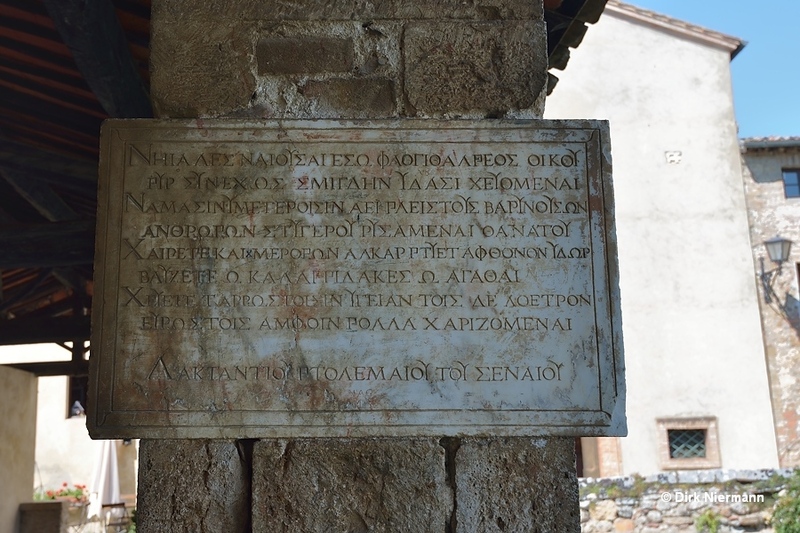 A Greek inscription from the early 16th century, attached to a pillar of St. Catherine's gallery next to Bagno Grande, consecrates the spring to the Naiads, water nymphs of Greek mythology. It's a misterious occurence, somewhat fallen out of time and cultural context. The inscription translates, "Oh Naiads, who live in these hot vapors, free the perennial fire among the waves, restore with your eternal flow the suffering ones free of odious death, I salute you, and you provide copious waters. Flow charmingly, o good springs, and with your flow bring health to the infirm and a very gentle bath to the healthy. Both will be grateful to you. Lattanzio Ptolemeo Senese." (Translation adapted from www.valdorcia.com). Through more than 30 single orifices the hot spring feeds Bagno Grande. One of the strongest vents is located in the northern part of the basin. Its discharge pressure is high enough to generate a clearly visible, pulsating water dome on the surface. 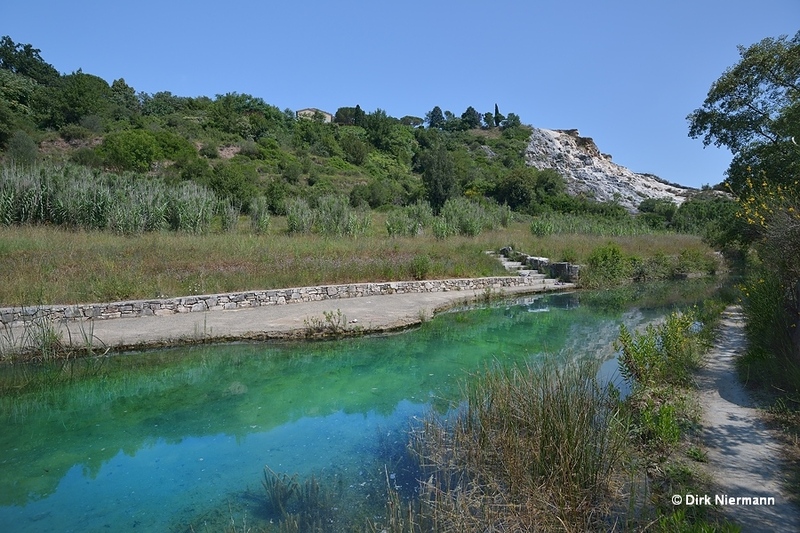 From the rectangular basin, measuring 48 x 24 m (157 x 79 feet) and enclosed by waist-high stone walls, much of the thermal water is channeled off to three spa termes that line the village. The remaining runoff tunnels St. Catherine's gallery, flows through the ancient bathhouse, and then follows an open, stone-carved duct over a distance of 180 m (590 feet) until it reaches the brink of the travertine slope. Nowadays, the thin stream runs directly to the edge of the drop-off where it has formed a slender travertine protrusion over time. The next picture shows also the stunning panorama of Val d'Orcia with the medieval fortress Rocca di Tentennano in right background. From the protrusion the thermal water cascades down the cliff in a naturally appearing manner, forming waterfalls, channels, pools, and terraces, until it finally joins the river Orcia. 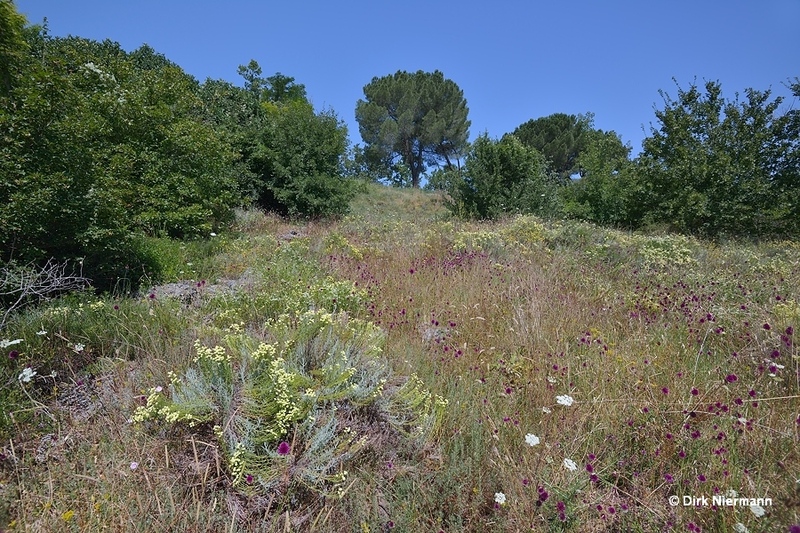 A species-rich community of thermophilic flowers, insects, and reptiles inhabits the south-exposed hillside. We observed large butterflies from close distance, such as the Scarce Swallowtail and the Old World Swallowtail, as well as the up to 4 cm (1.6 in) long scoliid wasp Megascolia maculata. 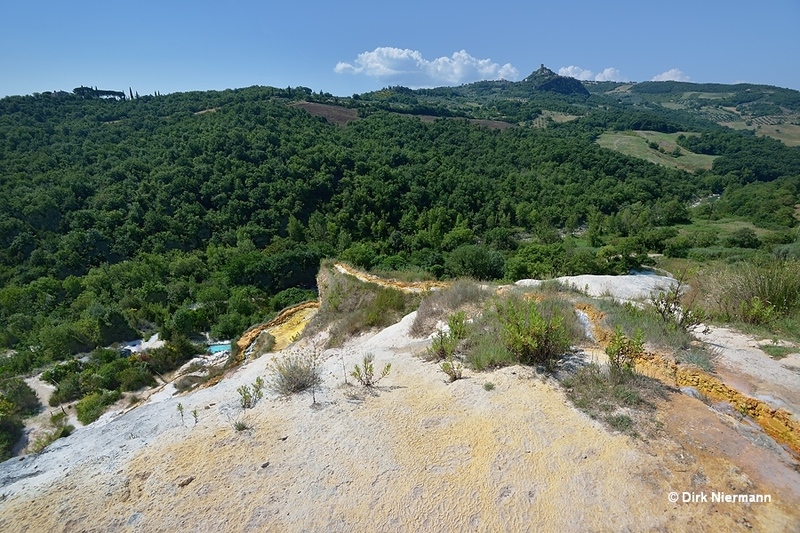 At the foot of the travertine cliff a large collecting basin, called La Gora (the Channel), has been carved into the rock. Here the water is significantly cooler compared to the spring, varying in summer between 23 and 35 °C (73 - 95 °F), which invites many visitors to take a bath. La Gora extends from east to west all along the foot of the incline. 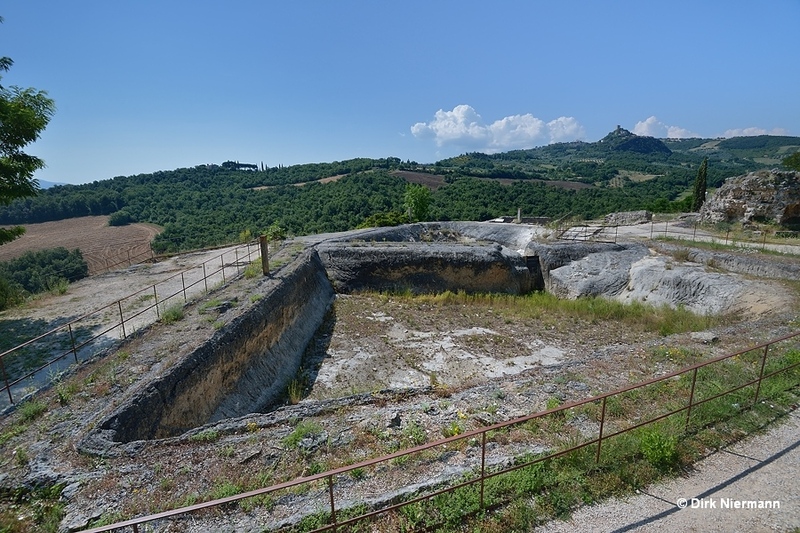 Over a long period, starting somewhen between the late twelfth and early thirteenth century and continuing up to the 1950s, the hot spring runoff from Bagno Grande was forced to serve human needs even to a much larger extend than today. During that time a worldwide unique construction of four hydraulic mills operated on the travertine slope, one on top of another. The setting was guarded and crowned by the Torre dei Mulini, a fortified tower, which was already destroyed at the beginning of the 18th century, probably by an earthquake. Where currently only one Gorello (duct) is left to conduct the thermal water, there once had been a network of channels feeding water into Le Gore (the channels), two large storage basins serving as millraces. 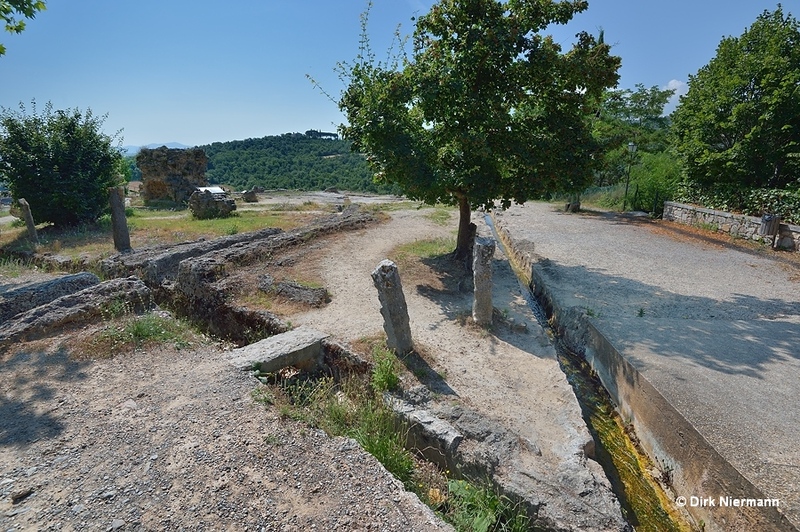 Archaeological excarvations and restoration works in 1999 brought Le Gore and some of the Gorelli back into the light of day, along with the remains of the mills, an ancient bathroom, and the basement of Torre dei Mulini. The hot spring granted a continuous water supply, even when the all other water bodies in the surroundings dried up in summer. After Le Gore, the two millraces, had been filled up, they permitted Mulino di Sopra (Top Mill) a grinding time of more than 8 hours. The two rooms of Mulino di Sopra, the upper one containing two horizontally oriented grindstones and the one underneath the mill wheels, are completely built into the travertine. A subterranean pipe led water form the storage tanks onto the mill wheels, wherefrom it was forwarded into the next storage tank, belonging to Mulino Buca (Hole Mill). 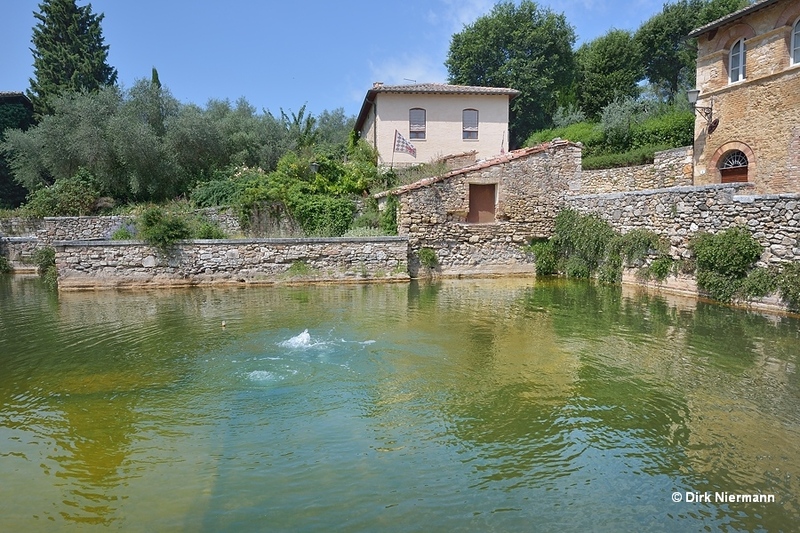 After driving Mulino Buca, the water was collected in the subjacent tank of Mulino di Mezzo (Middle Mill). 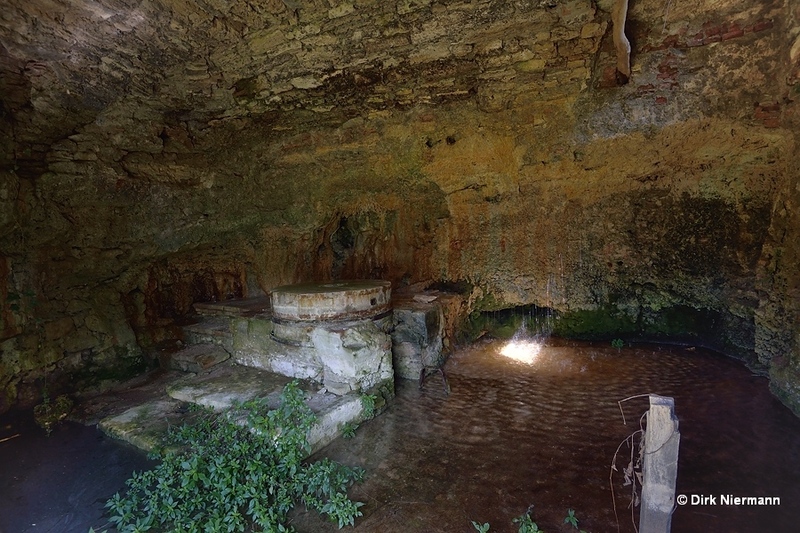 The sequence ended at Mulino da Piedi (Foot Mill), whose storage basin, La Gora, today is used for bathing, as shown on a picture above.